This card tells me I need to spend a bit more time in the wilderness – perhaps hug a few more trees, sing with the birds, and re-attune myself with Mother Earth and the natural elements. 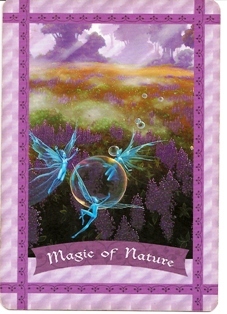 Card Meaning: Spend time outdoors, among the flowers, plants, and trees. Nature has powerful gifts that she wants to share with you, including ideas, information, and healing energy. Description: When you are disconnected from Mother Earth, you may feel depressed or lethargic without knowing why. Earth, too, feels distraught when you don’t connect with her on a regular basis. She needs you to be amidst her bbeauty so that she can telegraph information to you. In this way, you’ll know best how to care for your planet. By drawing this card, you’re being urged to spend time daily (even as little as five minutes) outside in nature. Remove your shoes, socks, or nylons, and connect your bare feet with the soil, sod, or sand. Close your eyes and take a few deep breaths as you’re surrounded by the magical energy of nature. Mentally ask the fairies to help you with any issues you may have. Then, open your eyes and look for their flitting light, which is the first sign that you’re seeing the fairies that surround you. Affirmation: I love being outside in nature. I feel energized by the sunshine, fresh air, plants, and animals. I take excellent care of every living being, including myself. Source: Healing with the Fairies Oracle Cards by Doreen Virtue, PH. D.
Growing a garden can be an excellent springboard for nurturing the health of your body, mind, and spirit. Long recognized for the physical properties of foods and medicines produced, gardening is also a benefit for its natural tranquility. Most of us are familiar with the phrase, “Stop and smell the roses.” Maintaining a garden can help one do exactly that — take the time to stop and smell the roses. Tending a garden also reinforces other parables, such as reaping what we sow and seeking soul food. Whether you’ve a big yard or a small balcony to work with, starting and growing a garden may improve your health and your living conditions on both the physical and the spiritual planes! On the physical plane, growing your own garden can do wonders for your health. Time and conditions allowing, you may choose to grow your own vegetables, thereby insuring that what you ingest is completely organic and the freshest in town! But if time, space and weather conditions interfere with the growing of vegetable crops, you can easily create a flourishing herb garden with rosemary, thyme, basil and other treasures from nature’s chest. Such herbs can be grown indoors in pots; they don’t require much, and the benefits they produce are countless. Your home grown herbs can then be used for culinary purposes, healing teas, bath satchels, herb pillows, incense, potpourri, household crafts, and more! Not only are these foods healthier and better for you, but home grown is generally quite a bit cheaper than store bought products. Food and herb gardens are a way of taking the body and soul back to the basics. Flower gardens offer many rewards for those who tend them. Flowers are pleasing to the senses for reasons many of us don’t stop to consider. But each individual flower has its own flavor, personality, energy, purposes, and properties (not to mention faeries!). Through color, shape, size, scent, and more, flowers communicate in a language that’s all their own – providing a sense of comfort we don’t find elsewhere. Stop and consider for a moment all the ways mankind has honored and used flowers throughout time. Each of the 50 states in the United States is represented by its own flower. Many flowers have religious symbolism; we send flowers in love, celebration, or sympathy. The essences of flowers are even bottled and sold for health purposes! We may not understand the inner workings of the effects flowers have over us, but there’s not much doubt in the fact that flowers are powerful. Having fresh flowers in a home makes those in the home feel more relaxed and comfortable in most situations and while modern conveniences allow flowers to be purchased at the local grocery store, there’s no feeling quite like arranging fresh cut flowers for various rooms in your home. Many flowers and plants are believed to have protective qualities, and are therefore planted or placed strategically in and around the home. To maximize the effects of gardening, such as producing larger, heartier plants, vegetables, herbs, and flowers, one can attune their gardening efforts in accord with the moon’s phases and astrological journey, tending to the garden with the care of the ancients, respecting the spirit within each plant and particle in order to harvest its magick. Some examples of such care are to only harvest on full moon nights, cutting plants with a single slice by a special blade. In addition, herbs are dried hanging upside-down in a warm, dark place, tied together by red ribbon. You don’t need to be an expert in order to start your own garden. You don’t need to be a full time farmer in order to enjoy the benefits of home grown vegetation. All you need are a few seeds of inspiration coupled with a little bit of magick. Once you get started, the benefits of gardening will continue to grow and take root, nurturing body, mind, and spirit.